Dubai, UAE, August 08, 2018: There are some women who will have a bathroom cupboard full of skincare products while others are quite happy with just a handful of essentials. While it is true that everyone has their own unique skin concerns, there are some skincare basics that every woman should have in order to build the perfect beauty regimen for great looking skin. Cleansers, toners, exfoliants, moisturizers and masks are products that have been scientifically proven over the years to help your skin. These essentials are necessary for an effective skincare regimen. 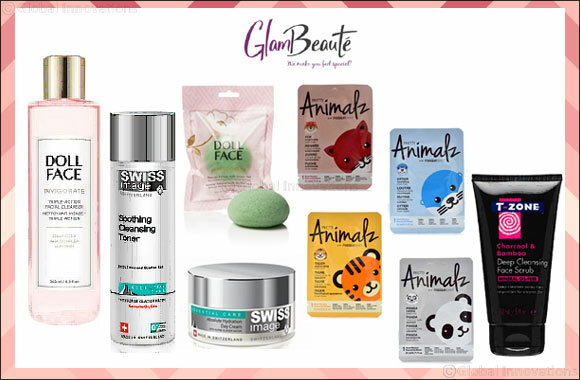 Glambeaute.com, the one-stop shop for every beauty need stocks a variety of such essentials from leading brands to suit and target most skin types and concerns. Everyone should have a cleanser in their skincare kit. At night, it works to remove make-up and grime from the day and in the morning, it removes any residual night cream and cleans out impurities. This invigorating, tantalizing foaming facial cleanser from Doll Face restores the skin’s natural glow without upsetting well-balanced oils. Nature’s most effective skin cleansing device! This dreamy, pillow-like natural konjac sponge gently cleanses skin while exfoliating dead and dull skin cells. Skin will look fresh, clean and bright with a baby-soft feel. The infused natural anti-oxidant Green Tea helps improve skin tone UV exposure and daily debris. Can be used in alone or with a cleanser. Toners are a great way to replenish and nourish skin after removing make-up and cleansing. A toner can quickly provide skin with generous amounts of antioxidants, soothing agents and vital hydrating ingredients. They help to tighten pores and balance skin pH levels, preparing the skin for creams and moisturizers. This soothing cleansing toner is a mild cleansing and toning formula with the natural extracts of Hyssop and Alpine Glacier Water that removes residue, tones and soothes skin. It is important to exfoliate a couple of times each week to slough off any dead skin cells. An exfoliant works deeper than a cleanser to shed older cells. This scrub from T-Zone deeply cleanses pores from impurities for a clearer looking skin with naturally derived Bamboo particles, Activated Charcoal and Grapefruit Extract. It has been specially formulated to deeply exfoliate, remove dead skin cells that can block pores, leave the skin looking clear and healthy. The ultra-purifying Activated Charcoal acts like a magnet to draw out dirt, impurities and excess oil. The most basic function of a moisturizer is to hydrate and soften skin. The skin naturally loses the ability to retain moisture as we age and daily activities such as washing, can strip natural hydrators from the surface of the skin. Creams applied in the morning are equipped to protect skin from the environmental aggressors faced outdoors while night creams focus on repairing damage to the skin as well as replenishing moisture levels. Enriched with the natural extracts of Edelweiss and Alpine Glacier Water, this light textured hydration day cream from Swiss Image is easily absorbed by the skin and offers long-lasting hydration and the nourishment of minerals and essential nutrients. The non- greasy overnight cream works in harmony with your skin’s natural regeneration cycle to replenish moisture levels and provide nourishment with essential nutrients. It is recommended to mask at least once a week and sheet masks are a wonderful addition to your basic skincare routine. They are easily the simplest and fastest way to hydrate your skin and packed with rich skincare ingredients. Pretty Animalz by Look Beauty is a fun collection of Korean sheet masks that leave skin nourished and even allow for fun masking selfies.